I can't get enough bunnies in my life these days! I love bunnies year round. I always have. They're just so darn cute! But in the Springtime, especially as Easter approaches, my days are filled with creating the darling little critters. Every year I make these bunny hats to sell and they are always very popular. 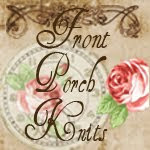 This one is on my new Etsy Shop ~ Front Porch Knits. I'll take a few to the local boutique this week also. I am knitting them out of a lovely blend of pima cotton and silk that is delightfully soft. I love the sheer ribbon bows tied around the ears for the Little Miss. This hat can also be worn by the Little Mr. just as easily by simply removing the bows. And the real kicker? The fluffy pom pom cotton tail in the back! Happy Bunny Trails To All Of You Today! Oh how sweet! Beautiful work, so charming! Thanks Sarah! I just love baby stuff. So sweet and fun to make. Thanks! I just love them!!! The bunny hat is sooo cute...nice work Danette! Thank you Jane! They are so fun to make. To have a precious baby again. Too cute. I will go out and mark your shop as a favorite. Thanks Eugenia! And I would be more than happy to make a custom order hat for your sweet friend myself. I have made several chemo hats. I had a friend a few years ago who battled breast cancer also & I made her a special hat. Just let me know if you would like me to do something for you. in white and the softest yarn possible. This is great. Feel free to communicate details to my email craftgangster@gmail.com. This hat is so adorable. Just love the little pompom tail! Thanks! That tail just grabs ya doesn't it?! The hat is adorable! Especially with the tail on the back. Awesome! Thanks Kar! Love that tail too! Great idea. Espesh with the little tail. Thanks Fi! Love the fluffy tail! Not as quick as I used to be but I am on the fast side. Still working up little Bunny Foo Foo's to sell downtown. What a cite bunny hat! I love it! Can Dinosaur Eggs Become Baby Blankets?